I Learned HTML for Free. Now What Do I Do? If you live on planet earth, someone at some point has told you to learn to code. 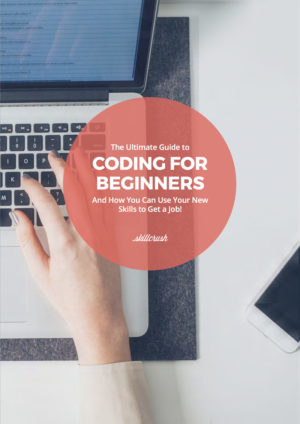 Whether you’re learning to code because you’re up for a big promotion at work, want an entirely new career, want to start freelancing on the side for extra cash or just want to learn something new for fun, picking up a few coding skills is really, really, REALLY good for you. I get asked this question from beginner students all the time. Below, I’ve outlined skills that are useful across multiple career paths. 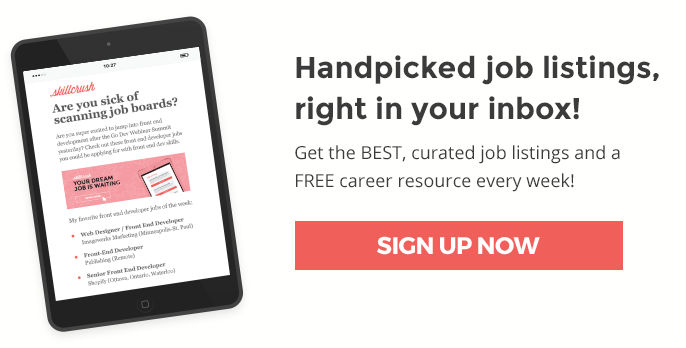 They’ll give you a great start if you want to work as a full stack developer but are also applicable if you work in journalism, marketing, or project management, just to name a few fields, as these and other roles are becoming increasingly tech-heavy. 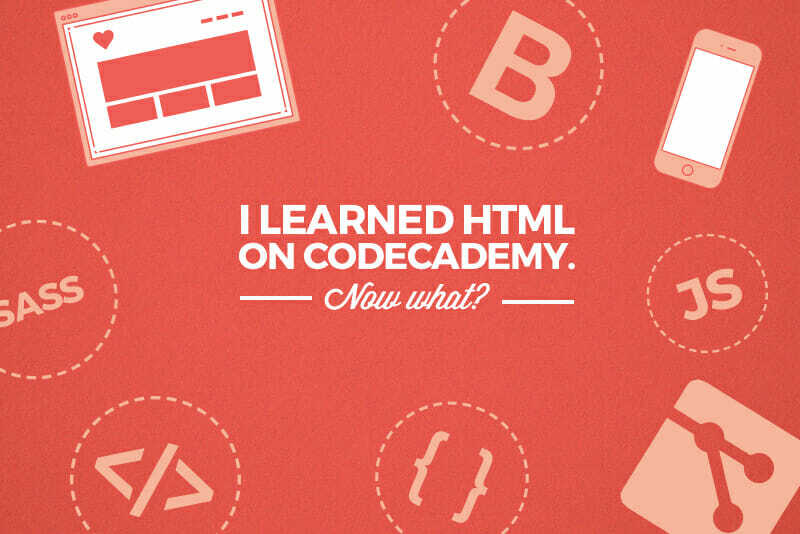 If you’ve learned HTML, you’ve essentially learned how to throw your content up on the web. But you’re probably looking at your first website and thinking why doesn’t it look as fancy schmancy as some of those cool hipster websites I keep seeing everywhere that have interactive components, or interesting scrolling techniques? 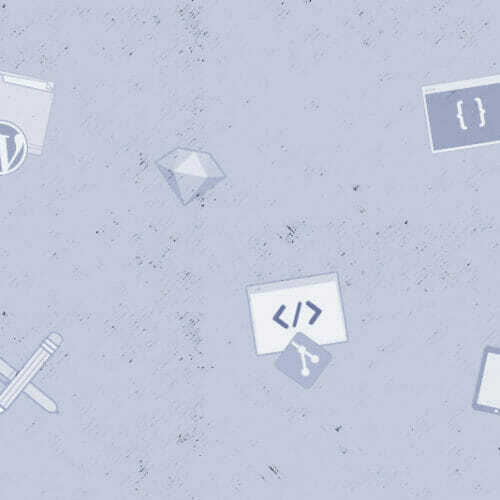 CSS/CSS3 – Make that content look amazing and add some cool animations and effects by learning CSS. 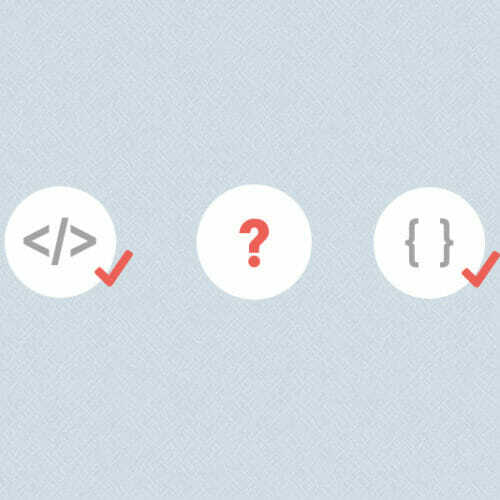 CSS is basically HTML’s significant other. 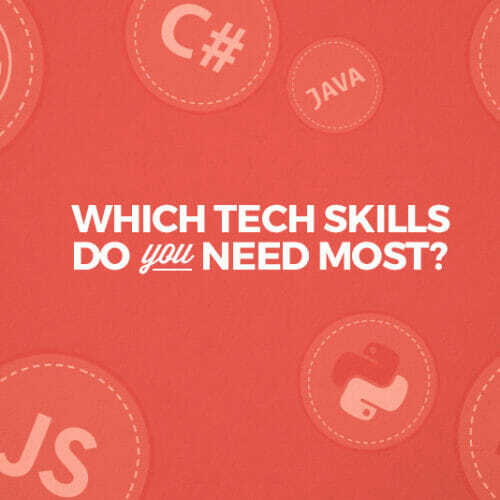 HTML and CSS are the first two skills you should master and they’ll come in handy no matter what career path you choose. 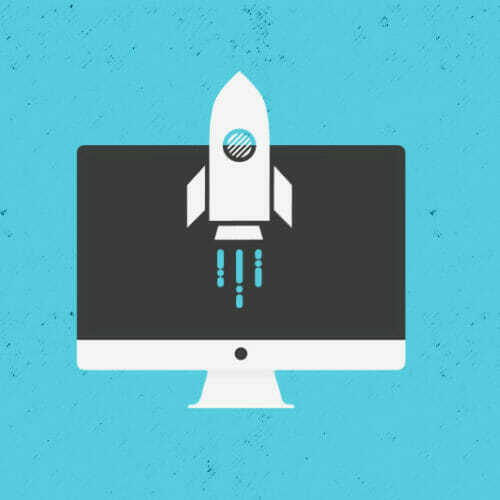 You could become a front end developer (shameless plug: Our Front End Developer Career Blueprint teaches you everything you need to become a front end powerhouse!) or you could end up using HTML and CSS as a digital marketer (such an in-demand career right now and HINT – could be an upcoming career blueprint right here at Skillcrush!). Or heck, you could start a small freelance business on nights and weekends, using these skills to build small sites for clients. Responsive Web Design – You’ll want to learn RWD as part of your HTML/CSS journey. Essentially, Responsive Web Design is all about making sure whatever you’re building is device-agnostic and works on all browsers across any device a person may use, whether it’s a laptop, tablet, smartphone, or anything else. Agile + Scrum – If you want to work on design or development teams, it’s a good idea to familiarize yourself with the Agile way of thinking. Read about Agile in the Agile Manifesto and then familiarize yourself with Scrum at a high level. Understanding how projects are run and how modern teams work together and deliver work is important if you want to work in the biz. Git + Github – Web development is all about working with diverse teams. Teams working on the same projects need version control, remote storage, backup, sharing, and commenting capabilities. Git and Github will let you connect your machine to the cloud where you can share your code with your team, collaborate, comment, and make changes to your projects. You can revert to old versions at any time and everything is backed up. I know people who don’t know a lick of code who actively use Github to manage their work, it’s THAT well known and widespread! Sass & Less – Sass and Less are both CSS preprocessors that allow you to simplify your stylesheets and scale your website. You can learn more about Sass and Less here, here, and here. It’s important when you’re learning new skills to socialize and immerse yourself in environments where there are conversations and engagement around these skills. Meetups, conferences, workshops, lectures—not only do these help the learning process along by introducing concepts and skills in new ways, but you’ll meet a network of people you can learn from and with! Meetup.com is a great place to find groups who convene regularly to work on the skills you’re learning. Participating in community meetups/events like this are how I met my coding buddies and mentors! Having a squad is KEY in helping you achieve your learning goals. 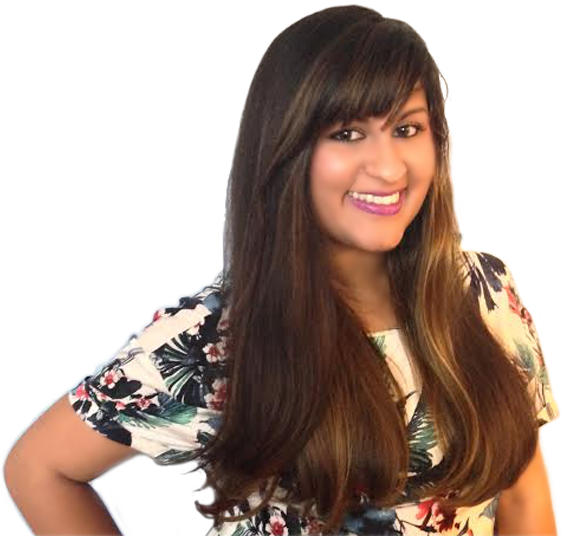 GirlDevelopIt – GirlDevelopIt has a ton of weekend workshops that’ll add awesome skills to your resume. WomenWhoCode – I love my city’s chapter of WomenWhoCode and have even been to their meetups in other cities when I travel. Lots of great events and networking opportunities here. She Says – I recently became familiar with She Says and our Austin chapter has been hosting some really great talks recently ie. Financial literacy, negotiation strategies + other complementary career-skills. Agile Project Management Meetups – Meetup.com has a ton of great agile and scrum meetups, workshops and events! Find one in your city and attend the talks. You’ll find a mix of folks – developers, designers, product managers and project managers – all discussing processes and frameworks that make their teams successful. Building a portfolio of work is the most important thing to focus on if you want to get hired. If your portfolio isn’t solid, you can forget landing even an initial phone screen! Check out this 2 part series (Part I, Part 2) on how to get started creating your portfolio and check out a few guiding principles below. No one has a perfect portfolio – You should feel OK with putting up work that isn’t perfect! Even the most seasoned developers don’t have spotless portfolios. In fact, the best ones put up work and add commentary around what they think they could have done better or what they plan to do in version 2.0. Putting up good work is important but I’d say putting up work at all is even more important when you’re getting started. Tell the story – Work without context is a missed opportunity. The best portfolios showcase work and tell the story from end to end. What were you trying to achieve? What were you trying to fix/solve/improve on? How did you pivot? What surprised you? How did you arrive at the end goal? Make sure you talk about all the phases of a particular project and as I mentioned above, add commentary around what you would have done given more time/what you plan to do next time. Your portfolio is never done – I am ALWAYS and FOREVER redesigning my portfolio. It’s just a fact of life. Don’t wait to create a portfolio until you have the right skills or right skill level. Just get it up there and join the Forever Redesign Club! Everything is a work in progress. Everyone is a work in progress. Don’t be afraid to create projects for yourself – Portfolio work doesn’t have to be work you did for clients! Don’t be afraid to think of DREAM projects and include them in your portfolio. The first developer I ever hired had NEVER worked for a client but had a portfolio FULL of imaginary projects (including a New York Times redesign) that blew me away. Projects like these also let you continue to practice. And regular, sustained practice is SUPER important.